Blackberry is a dark red or black shiny aggregate fruit consisting of small drupelets arranged in circular fashion. Each small drupelets feature juicy pulp with single small seed. The black berry measures about 3-4 cm in length containing about 80-100 drupelets. Blackberries are rich source of powerful antioxidants. Scientific studies show that these antioxidant compounds may have potential health benefits against aging, cancer, inflammation, and neurological diseases. Blackberry fruit is a good source of Vitamin C which boost immune system and helps a lot to protect against many infectious problems. Blackberry fruit also contains an adequate amount of Vitamin E, A and K.
Blackberry fruit is a good source of soluble and insoluble fiber and very low in calories. Even 100 g berries provide just 43 calories. Being low in calories they are also very helpful for weight loss. This soft flesh juicy fruit is used in making of delicious desserts, jams and seedless jellies. 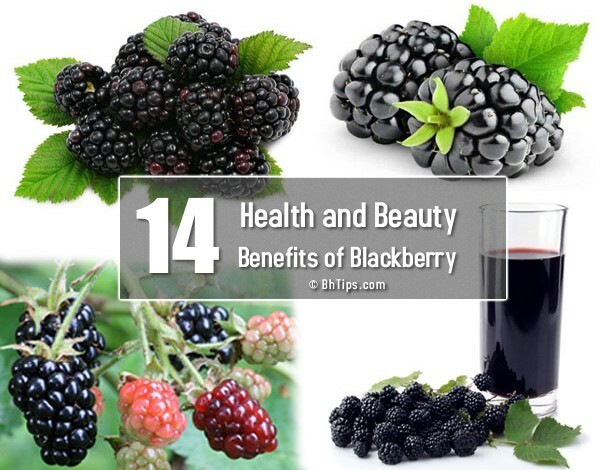 Let's have a look on best health and beauty benefits of Blackberry Fruit. Anthocyanins that give blackberries their dark color are antioxidants shown to reduce inflammation by helping combat free radicals in the body that destroy cells and lead to heart disease. Blackberries are said to strengthen blood vessels and prevents many heart diseases. Blackberries contain minerals like potassium, manganese, copper, and magnesium. These help in production of white and red blood cells. Calcium in blackberry helps to strengthen bones.Blackberries are a good source of Vitamin K that aid the absorption of calcium and also play a vital role in blood clotting. Blackberries are high in potassium, that helps reduce insulin. Consume blackberries daily with one teaspoon of honey to control diabetes. Continue this for a week for good results. Leaves are also consumed for anti-diabetic properties. Antioxidants and antibacterial properties of blackberry are very helpful to cure dysentery. A tea made from blackberry leaves is more effective in in treatment of dysentery. Boil one or two tablespoons of blackberries or dried blackberry leaves in 1 and half cups of water for 10-12 minutes. Strain and drink this blackberry tea 3-4 times a day. The leaves of blackberries have been used to treat mild inflammation of the gums. Chewing leaves of blackberry is also considred very effective in treatment of bleeding gums. You can also boil some blackberry leaves and roots in some water. Let it cool down and use this water to gargle the mouth twice a day. Note: If you don't get cure, consult your problem with a qualified dentist. Blackberries have ellagic acid. Scientific research has found that ellagic acid can help in the prevention of certain cancer cells. Anthocyanins, which give blackberries their dark color, are an antioxidant, they destroy free radicals in the body that harm cells and lead to cancer. Blackberry contain a good amount of Vitamin C, which protects the immune system and may lower the risk of developing certain types of cancer. The high tannin content of blackberries provides a number of benefits to reduce intestinal inflammation, alleviate hemorrhoids and soothe the effects of diarrhea. Blackberries are rich in Vitamin C, antioxidants and many essential minerals which improves and strengthen immune system to fight against disease causing germs. Blackberries contain rich amount of fiber, which promotes healthy digestion and aids in maintaining bowel regularity by bulking up the feces and reducing the time it takes matter to pass all the way through the intestines. Bowel regularity is commonly associated with a decreased risk for colon cancer. Blackberries help a lot to relieve the common symptoms of post menopause. Phytoestrogens are naturally occurring plant estrogens found in blackberries that may help relieve the common symptoms of post menopause like bloating, food cravings, and even menopausal symptoms including hot flashes. High content of Vitamin C in Blackberry reduce the chances of macular degeneration, a condition in which fine vision deteriorates, resulting in central vision loss and is the leading cause of blindness in people over 50. Antioxidants properties of blackberries are very helpful in getting rid of acne as well as acne scars. Blackberries contain ellagic acid, it protects skin from the harmful effects of UV rays. High content of Vitamin C in Blackberry not only help to get healthy and glowing skin but also reduce the appearance of wrinkles and help to get younger looking skin. Blackberry promotes tightening of tissue, which is a great non-surgical procedure to make skin look younger.